Time | Segment ———|————— 00:00 | Adam Cole-Mullen, from Boston, USA, playing in the Under-18 Fiddle Competition at Fleadh Cheoil na hÉireann 2010 in Cavan. Adam plays an unusual setting of “George White’s Reel”. 01:39 | A hornpipe played by Aoife Cunningham from Crosskeys, Cavan in the Under-18 Fiddle Competition at Fleadh Cheoil na hÉireann 2010 in Cavan. Aoife came third in the competition. 04:25 | In the Under-18 Fiddle Competition at Fleadh Cheoil na hÉireann in Cavan Raphael Makarewich, St. Louis, USA, plays the muti-part jig “Cherish the Ladies”. 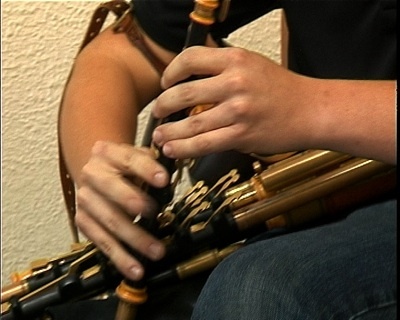 07:19 | All-Ireland Champion on Uilleann Pipes for 2010 is Michael Stribbling, Tallahassee, Florida, USA. Michael plays “Garret Barry’s Reel” and “The Cameroonian” and is accompanied by his brother Daniel (on bazouki), who took third place in Under-18 Accompaniment. 09:59 | Two jigs - “McIntyre’s Fancy” (composed by John Brady) and “Behind the Haystack” - played by the Árd Eiscir Céilí Band, who tied for third place at the All-Ireland Senior Céilí Bands Competition 2010. Members of the band are - Arthur O’Connor, Cathal Guinan and Claire Quinn (fiddles); Adrian Brady and Eoin Carton (flutes); James Hogan (accordion); Leila Brady (concertina); James Harvey (banjo); Fiona Corbett (piano) and Linda McGill (drums). 13:43 | Knockmore Céilí Band from Derrygonnelly, Co. Fermanagh play a selection of reels - “The Green Mountain” and “Billy McComiskey’s” at Fleadh Cheoil na hÉireann 2010. Band members are - Maggie Maguire, Maria Connelly and Michael Kerr (Fiddles), Ashling McPhillips and Lorena Maguire (flutes), Chris Maguire and Catherine Mulligan (accordions), Owen Maguire (banjo), Ronan Warnock (piano) and Kieran Leonard (drums). 15:16 | The Lackagh Céilí Band from Co. Galway play “The Ballyoran Hornpipe” at Fleadh Cheoil na hÉireann 2010 in Cavan. Band members are: Gerry Hegarty, Maria Fahy and Aoife Burke (fiddles); Claire Watts and Sacra Furey (flutes); Maude Connolly (concertina); Celia Delaney (banjo); Gina Loughnane (piano); Páraic Carr (drums). 17:38 | From Manchester, Britain, St. Wilfrid’s/ O’Carolan Céilí Band play a selection of reels - “The Palm Tree” and “Mossy Banks” - at Fleadh Cheoil na hÉireann 2010 in Cavan. Band members are: Maria Williams, Kevin Madden and Sinéad Hayes (fiddles); Sarah Williams, Stephanie-Jo Kelly and Anthony Quinn (flutes); Michelle O’Leary (accordion); Andrew Taylor (Piano); Debbie Lynch (drums).